Whenever one enters the Entropic Chasm, occasionally they bear witness to evil little giggles and mischievous laughter. At first it's registered in the back of one's mind as simply the ambient noise of Inferis, and it's left alone. If investigated, however, it can often lead to turmoil in the form of probably the nastiest little buggers in all of Hell - the Slimelings. Nobody really can say where they came from, only that they exist. 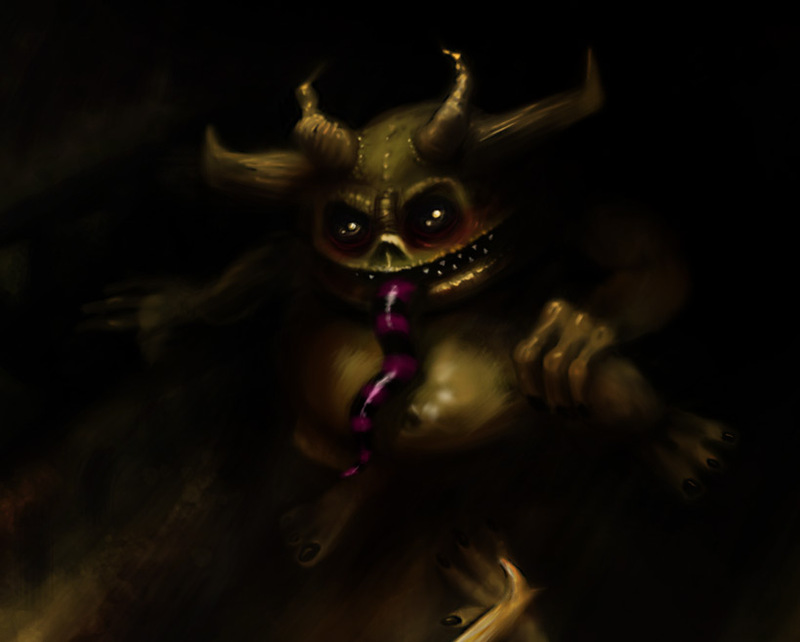 Slimelings are essentially baby demons, stuck in the same form for pretty much all of eternity. They are monstrous, covered in filth and decay, and seek nothing but their own amusement. Thankfully most of the time they are sleeping given the fact that they are still Entropic Demons and as such are slothful by nature. But despite this, they are also very, very annoying. Always attacking in groups, they won't stop until you are pinned to the ground so that they can 'play' with you properly. Abilities: They mostly swarm in groups. Primarily they attack through the use of melee, occasionally biting and kicking, though they do on occasion barf up whatever was in their entropic guts. Their greatest threat is when they attack in large numbers. - And you thought I was kidding about the mutant slug/demon/human hybrids...shame on you for doubting me.